YEREVAN. – The topic of discussion with the authorities can only be the resignation of Serzh Sargsyan. 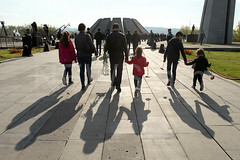 “My Step” initiative leader, opposition Civil Contract Party Political Council member, and National Assembly (NA) of Armenia “Way Out” (Yelk) Faction head Nikol Pashinyan on Saturday told aforesaid to reporters, during the “My Step” march in capital city Yerevan. He noted this commenting on Prime Minister Serzh Sargsyan’s proposal to him to immediately sit at the negotiating table. 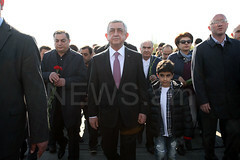 Also, he stated that Sargsyan has no control over the current situation and his obstinacy threatens Armenia. “If they [the police] take, apprehend, arrest or detain me, I call on Armenia’s citizens to go out and close off all the roads, block all the police departments, all public administration buildings,” Pashinyan stated adding that his arrest cannot stop the process. As reported earlier, Serzh Sargsyan issued a statement and called on Nikol Pashinyan to immediately “sit at the table of political dialogue and negotiations,” while the police threatened to stop the rally. Nikol Pashinyan and his supporters are staging protests in capital city Yerevan ever since April 13, and by marching, holding rallies, as well as blocking streets and squares. They protest against ex-President Serzh Sargsyan being elected Prime Minister of Armenia.